SANTA CLARA, Calif.--(BUSINESS WIRE)--Leading interactive entertainment media publisher and developer BANDAI NAMCO Entertainment America Inc. today announces it has launched TEKKEN™ 7 in the Americas for the PlayStation®4 computer entertainment system, Xbox One, and PC via STEAM®. TEKKEN 7, the latest chapter of the best-selling fighting game franchise is set to deliver core fighting game action and competition through heart-pounding 1 vs. 1 bouts. TEKKEN 7 will also present the latest developments and provide some closure to the TEKKEN storyline centered around the eternal struggle for power amongst the members of the Mishima clan. TEKKEN 7 was developed at BANDAI NAMCO Entertainment Inc.’s Tokyo, Japan studio under the leadership of franchise director, Katsuhiro Harada. Powered by Unreal Engine 4, TEKKEN 7 sets new standards in graphics quality for the series and the fighting game genre, featuring highly detailed characters, dynamic animations, and unique environments. TEKKEN 7 features numerous modes and enhancements beyond its arcade counterpart, including an in-depth story mode that enables players to fully experience the epic TEKKEN canon storyline. Players will also be able to check out new fighters such as Akuma from Ultra Street Fighter® IV, Kazumi Mishima, Claudio, Josie, Shaheen, Katarina, Lucky Chloe, Gigas, and master their respective fighting styles. 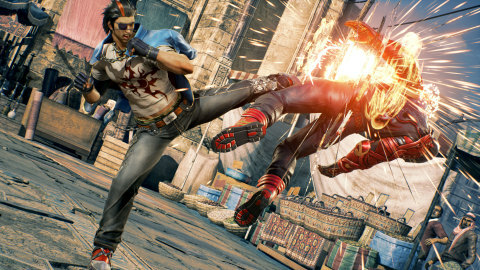 TEKKEN 7 also delivers new abilities for players to employ during bouts such as Rage Arts, Power Crushes, and Rage Drives; all designed to increase the tension of each battle within the game. Rated “T” for Teen by the ESRB, TEKKEN 7 is offered with a MSRP of $59.99 for the regular edition, $84.99 for the digital deluxe edition, and $149.99 for the Collector’s Edition (available for PlayStation 4 and Xbox One only). TEKKEN 7 is available now for the PlayStation 4 computer entertainment system, Xbox One, and PCs via STEAM in North America, Latin America, and Brazil. For more information about everything in the TEKKEN universe, please visit: http://tk7.tekken.com/. For more information on TEKKEN World Tour, visit the official website at http://tekkenworldtour.com. To learn more about BANDAI NAMCO Entertainment America Inc.’s other products and services go to: http://www.bandainamcoent.com/home.html. Join the conversation and follow us on BANDAI NAMCO Entertainment America Inc. Facebook at: www.facebook.com/BandaiNamcoUS or the TEKKEN Facebook page at: www.facebook.com/TekkenAmericas. Press Release © 2017 BANDAI NAMCO Entertainment America Inc.